So this one is just sort of out of left field. I want to try using a diffuser with my sort of curly hair. 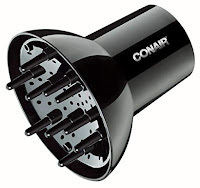 And it looks like the Conair Volumizing Diffuser should fit my beloved Yellowbird dryer. I've looked into how to care for curly hair to play it up a bit, but nothing really works well with my job (if you start the day in a hair net or hat, it's very seldom a 'good hair day'). So maybe drying it this way on the weekends will give me a chance to be a little more natural with it? I tend to go with a ponytail or other sort of clip usually now. Work has also trained me that now even when I cook at home, I usually tie my hair up or back (out of the way..). I'd like to give this a try, I think. Have you tried a diffuser? What did you think?